Through most religious texts we are taught that there is a heaven and a hell. We are told that heaven is a sanctuary for the good amongst us; and hell is a place for the rest. However, are these teachings more poetic than actually physical? Have the two concepts of heaven and hell just been created to control mankind into trying to live an orderly life? Well. It is clear that when we look up, we don’t see heaven – we have sent plenty of spacecraft into the sky to find no sanctuary covered with fluffy clouds littered with naked angels playing the harp. But, what if hell was actually beneath your feet? This article delves into the possibility that the big red fella with a goatee & sharp pointy stick perhaps is constantly looking up at us from the deep fiery depths of the Earth, waiting for our arrival…..
A legend holds that in 1989, a group of Russian scientists had bored into the earth for about nine miles in Siberia until they hit a cavity of some kind. The most bizarre thing though, that the scientists could hear a very distant noise which was coming through the hole. Unsure of what these sounds were or what they meant, the scientists lowered an extremely heat resistant microphone into the opening in the ground to pick up some fairly blood curdling sounds. The story was picked up by Finnish press, and then by Trinity Broadcasting Network in England who created this broadcast. … However, this was all a hoax. The sounds you hear on that audio clip are in fact from the film ‘Baron Blood’ with different audio affects also placed on top. In fact, the whole story was fake; based upon another hole that the Soviet Union had drilled called the Kola Superdeep Borehole. There were no supernatural findings. During the early 1970s in Durweze, Turkmenistan, Soviet geologists accidentally drilled through a natural cavern which in turn destroyed their equipment; leaving them with a seventy meter wide hole. The group of scientists were scared that by opening this natural cavern, they in turn would be releasing poisonous gasses into the atmosphere – so they decided to create a fire and burn it off, predicting that the fire would last a few days. Forty years later, the cavern is still on fire. 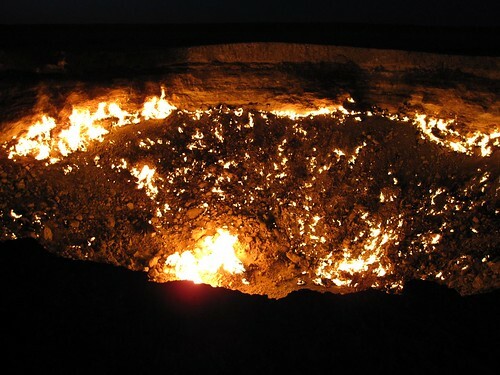 Locals in Turkmenistan claim that the cavern is the ‘Door to hell’. However, is it really the door to hell – or in fact a natural phenomenon…you can only decide for yourself (though it’s rather obvious that this article is just a bit of fun and anything that has been burning for forty years is pretty cool!). This not entirely serious analysis was provided by Thorpe Park Breaks in the UK. They are eagerly researching for this year’s fright night and are currently obsessed with whatever supernatural stories they stumble across. 8 Responses to A Well to Hell Discovered in Russia? This is definitely thought provoking! A 40 year fire? Wow. Wow, cool and freaky at the same time! I’m with Nancy – they should tap the energy as a source of power for heat – it’s pretty cold in Russia.